When many of our guests journey to Family House and take their first steps into our beautiful home, they’re immediately welcomed by our warm volunteers at the front desk and are surrounded by the stunning art here: North Carolina pottery, photos of places nearby, paintings old and new, and colorful textile collages. More research now points to the healing components of art and its potential to reduce stress in patients. Studies show a direct link between the content of images and the brain’s reaction to pain, stress, and anxiety (reference: More Hospitals Use the Healing Powers of Public Art). When SECU Family House was built seven years ago, the first board of directors wanted our hospitality house to reflect the people of North Carolina. As a result of their vision, each of the guest rooms and all of our community spaces showcase North Carolina artists, some of whom were born here and some who moved to this area from afar. 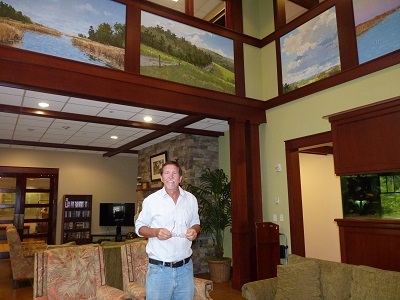 Local muralist Michael Brown has several of his murals in our Great Room. Mr. Brown was a fine arts major at UNC-Chapel Hill, a journeyman of sorts whose training took him to working in Massachusetts, teaching at the Guggenheim in New York, and painting in Spain. When he returned to Chapel Hill, he was approached by a citizen’s group to paint a mural for a system-wide school event. He’s been painting murals ever since. In mid 2000, Katie Early, a former Family House board member, asked him if he was interested in doing a landscape panorama for Family House. Working closely with Dana McMahan, another former board member who was charged with decorating the house, Mr. Brown created nine murals for us. They reflect all the seasons in North Carolina, and are stunning works of art. Mr. Brown shared that he tries to be sensitive to the population that will be seeing his art. He wants his art to be welcoming and to give the viewer a chance to be engaged in the work with hopes of evoking positive memories of times past. When one gazes up at his murals in the Family House Great Room, there is no doubt that the connection between art and healing is happening for our guests. Another artist whose work is prominently displayed in Family House is award-winning textile artist, Elaine O’Neil. After growing up in rural Maine, Ms. O’Neil studied at the Philadelphia College of Textiles and Science, and eventually settled in Orange County, North Carolina. Her textile collages can be found in homes, businesses, and several colleges and hospitals including UNC Hospitals. In addition to her collages, Ms. O’Neil has illustrated two children’s books, “Grandma Elf’s Letter Sweater” and “Road Trip Carolina.” For the past five years she’s illustrated a “Luv This Place” North Carolina art calendar. A percentage of the proceeds from calendar sales is shared with the N.C. Cancer Hospital. As Ms. O’Neil tells it, her collages are about where “good things happen,” connecting people with other people, or in our case, connecting people with newfound friends. She wants her art to evoke feelings of cheer and happiness. When asked why it’s important to her to have her work in healing spaces such as Family House and UNC Hospitals, Ms. O’Neil shared that she hopes her art gives the viewer a chance to escape, if for a moment, from the ravages of an illness, takes a bit of stress away, and provides a moment of peace. If her art can urge a smile and allow a patient to feel “uplifted even for a minute,” then it has done what she’s hoped for. Drs. 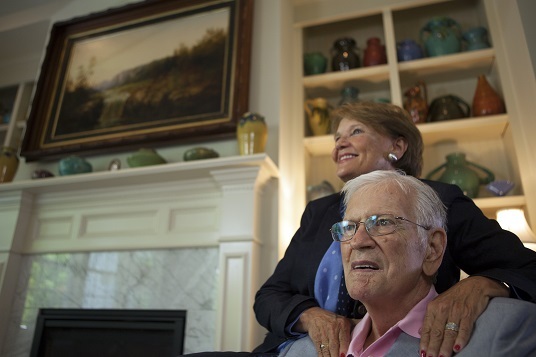 Everette James and Nancy Farmer have combined their love of North Carolina art with their love of giving back to the state where they first met over 20 years ago. As major collectors of 1850 American impressionist art, they’ve collected, loaned and given away large volumes of art to exhibitions, museums, churches, embassies, colleges and hospitals. Dr. James sees a link between “art and the art of bodily, mental and spiritual healing,” and they see first-hand how art heals people. “Paintings become old friends when you see them every day,” says Dr. Farmer. Art gives spaces a structure and allows one to feel a variety of emotions. Much of Drs. James and Farmer’s focus is on sharing their vast collection with their beloved North Carolina, and they have gifted several pieces to Family House. As you enter our hospitality house, one of the first things you see is a glass case containing a collection of utilitarian pottery. Beside the case is a description of the pottery, so you can learn about the pieces. As you go up the stairs towards the second floor, there are several oil paintings on the wall – another gift to the house from them. As with Michael Brown’s murals and Elaine O’Neil’s textile collages, oftentimes we see our guests stopping for moment to enjoy these beautiful pieces, and experiencing what the pieces are meant to evoke: a happy memory, a smile, a thought long gone; giving them, if for a moment, pause from whatever medical crisis they’re going through. Dr. James feels that “people want an identity to things” and that their collection of art is a memory bank of history that teaches generations about a time long past. For Drs. James and Farmer, sharing their art, and watching the joy others get when the art is shared, gives them immense pleasure. The art in Family House, given so generously by fine artists and collectors, does all that it is meant to do. Viewing beautiful art “is an opportunity to peacefully reflect or to learn from explanatory labels and distract themselves from hardships,” according to Dr. James. At Family House, art has created a healing environment for everyone here. Watch the Family House Diary Art & Healing to see many of the works of art, and hear from those involved.